There is a saying about never saying "Never"
This photo was taken on June 28, 2018 at 8:15 AM. The "Take It!" came from many months of trying to catch this Truck as it made its way as a part of the fleet of other Trash Trucks which serve the city (it is important to note right here - that is the only one I have seen out of the many which is painted in vivid Pink). I have no idea if there is a symbolism attached to the paint color of the truck, and in the emerging world of it all - it should make no difference if the cause is to blend in. Oddly enough there is a trend emerging which has Trash Trucks being given a new level of attention from a maintenence standpoint. I believe most are now washed on a very regular basis - and are taking on a growing new level of respect. The After Take: Having come to this city with the intent of being here for just a few years - I now have passed my thirtieth year of residence and have watched it transition from a Nation's Capital that no one came to on the weekends - to one that is filled with visitors from all over the world on every day of the week. I believe the overwhelming majority leave having had a memorable and enjoyable experience. Our public spaces and streets are well used for regular traffic and special events (which are in abundance with the better weather). I think I have extended an invitation to make a visit to our Capital before, but if I have not, I encourage you to come here for there is seemingly something for everyone. 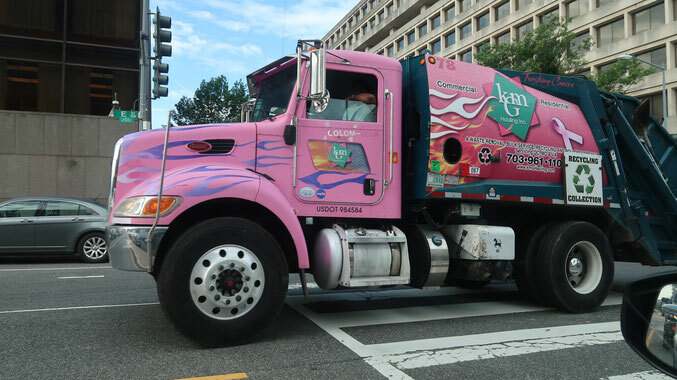 Who knows - you might just see a pink garbage truck which seems to be issuing a proud welcome as it goes about its work. Our daughter went nuts for this. Pink is her favorite color. She has now asked me four times if we can "make our car pink too." This reminds me of that tv show hosted by Xzibit that used to come on called Pimp My Ride. Well I suppose if you want your garbage truck to stand out that's one way to go about it. We used to have a guy that did dump hauling in our neighborhood. His truck was neon green with racing stripes on it. This picture reminds me of him. Oh I love it! I'd personally never do anything like that to my car but it sure is fun looking!